MP4 media file is basically a file in digital media format. It is used for the storage purpose of video and audio files. It can also help to store the other type of data files for instance still images and various subtitles. It is a kind of media container which means that it allows a blend of video, audio, subtitles and the still images which can be contained in the single file only. This format also allows the storage of advanced content like 3D Graphics, interactivity of the users and the menus. This tool is highly convenient and accessible and everyone can use it with ease. The official name of the file name extension is .mp4 but there are many different extensions available. This format is a protected and secure which makes use of DRM technology restricting copying. The base of MP4 is Apple Quick Time. The MP4 file was first utilized in 2001 as a standard ISO/IEC 14496-1:2001. Few years back it was converted to standard ISO/IEC 14496-14:2003. Both the MP4 and MOV formats make use of the similar kind of MPEG-4 Format so they can both conveniently work in QuickTime Environment. But MP4 is more popular and used as compared to the MOV because it can be operated through various types of platforms in addition to MACs. These other formats include Linux, Windows and many other mobile devices. •	It is an open standard file which is easy to use by anyone. •	It offers complete support for many different operating systems which makes it more reliable, thus allowing easy distribution. •	It gives higher levels of compression which produce smaller file formats as compared to other file types. •	The converted file format sustains its original quality. •	It is great choice for the purpose of capturing content having high level of motion. It gives clear, precise, sharp imaging which is ideal for any kind of video recording. •	Most of the video related applications support this format. •	It is the best choice for online video formatting or streaming. As MP4 is similar to MOV in many aspects, you can easily operate it on MAC. You will find it almost everywhere on internet. From running videos to the any other type of video content, this format is supported everywhere on the internet. Moreover, it takes very small disk space and that is the reason it is widely used for online video streaming and in creating the exclusive web compatible videos. There are many different types of video players and various converters that support this file format. Consequently, MP4 Players are widely used now days instead of MP3 players because they not only support the music players but also provide support for the MP4 Videos. 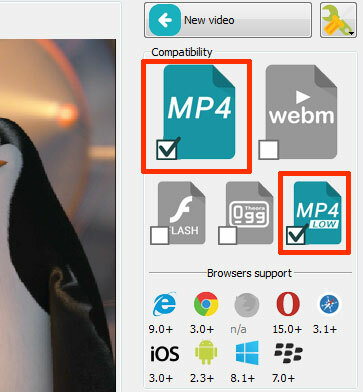 So MP4 format video files easily adjust to the small screen of any portable device. Moreover, for such conversion purposes there are many converters available such as the handy EasyHTML5Video converter, which can convert almost any video file to MP4 and other popular video formats. This video converter can be downloaded from http://easyhtml5video.com.